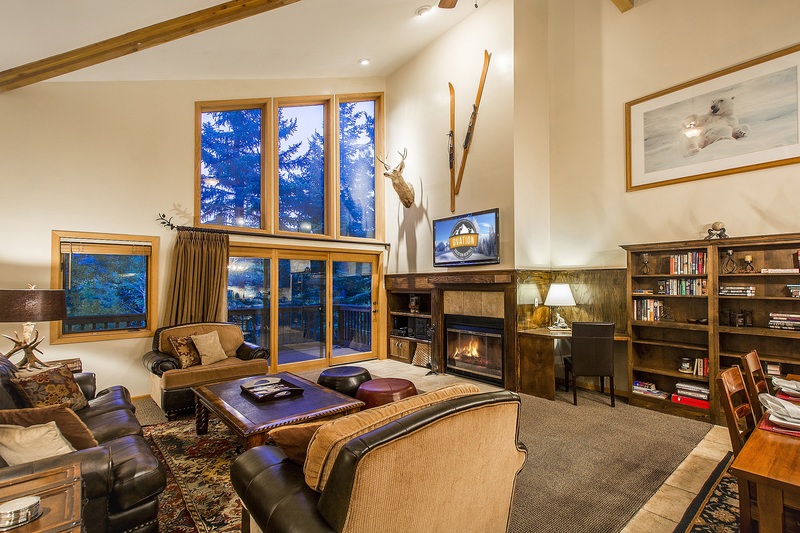 This the perfect vacation rental where you can make great memories and get out to have wonderful adventures. 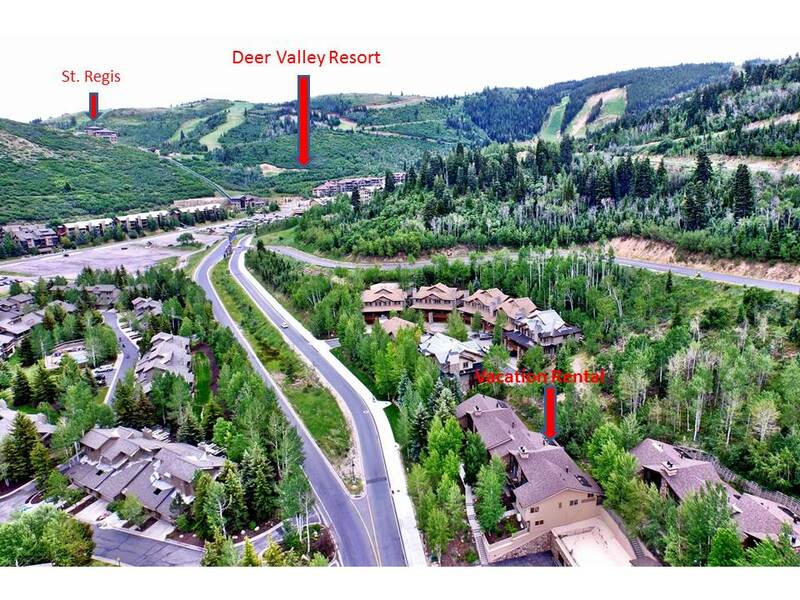 You can walk (10 minutes) to the Deer Valley Resort, or make your way to one of the free shuttle stops, approximately 345 ft. from the Townhome, to be dropped off right at the lifts for Deer Valley, at any of the Mountains in the area, or on Historic Main Street where you can dine and shop. 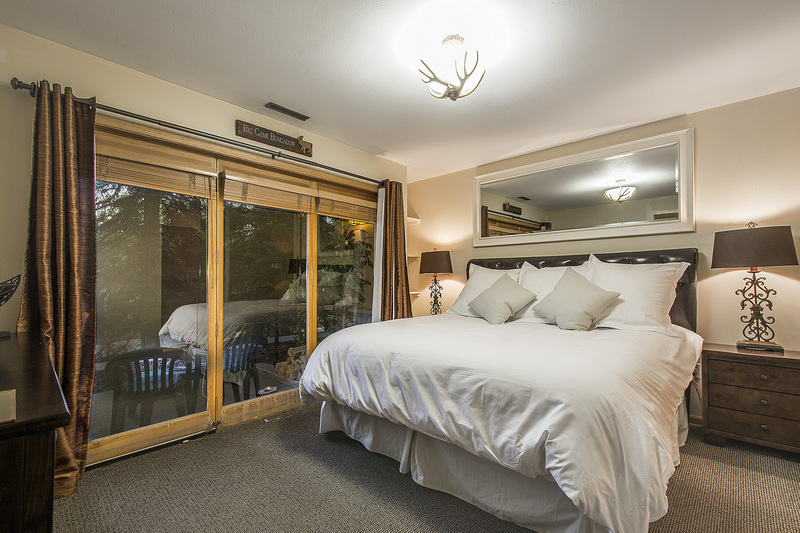 Walk down the street to the Deer Valley Café & Grocery where you can dine alfresco overlooking the lake or purchase gourmet groceries or takeaway meals. 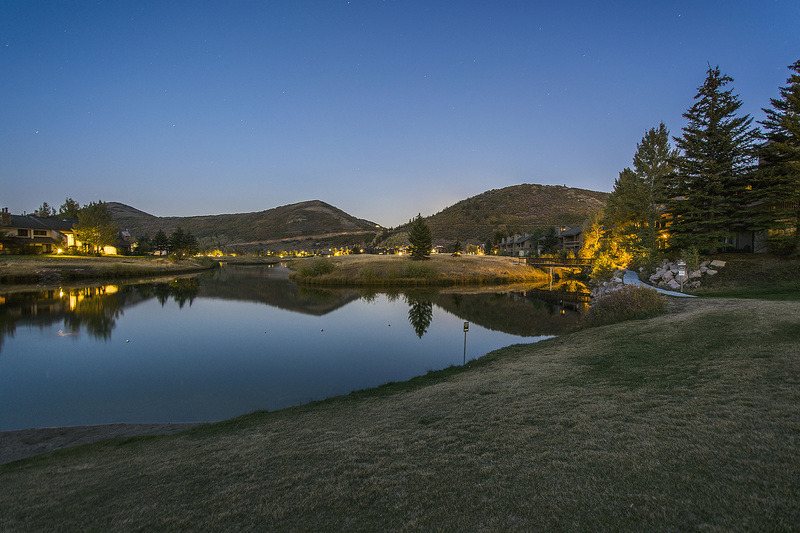 During the summer months, you can also rent a stand-up paddle board right off the beach outside the grocery and take a tour of the lake. 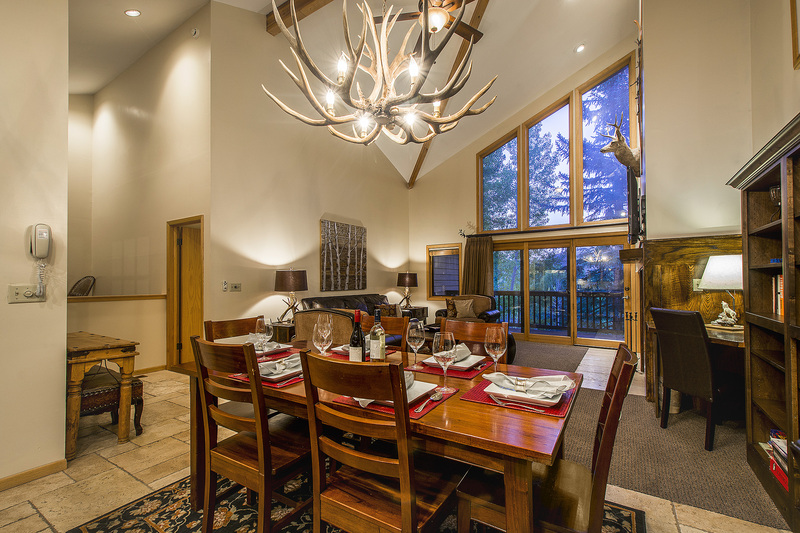 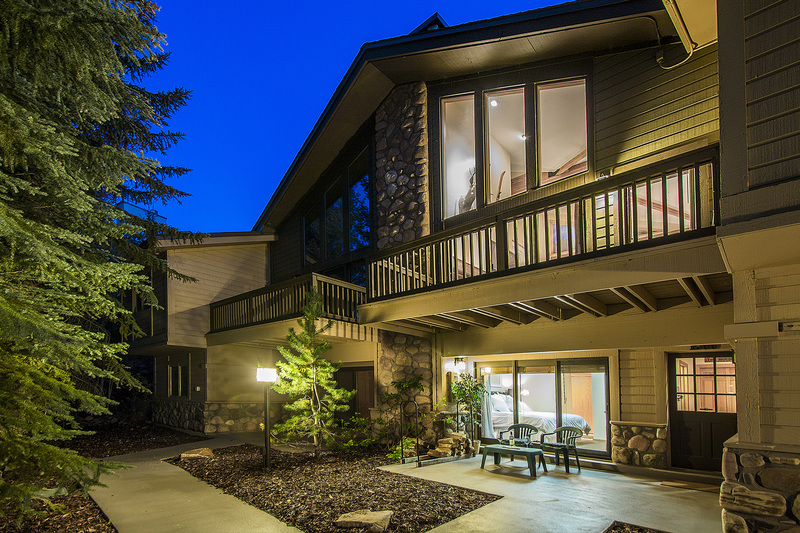 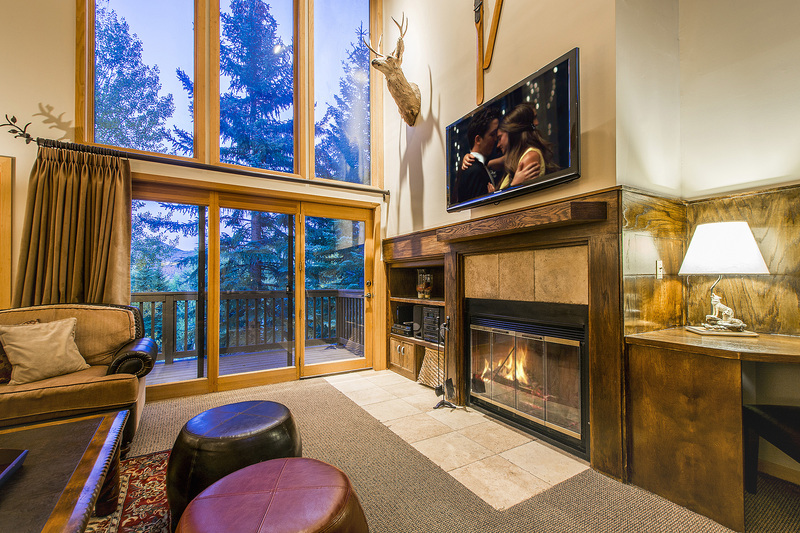 This home is the quintessential mountain retreat with modern mountain décor. 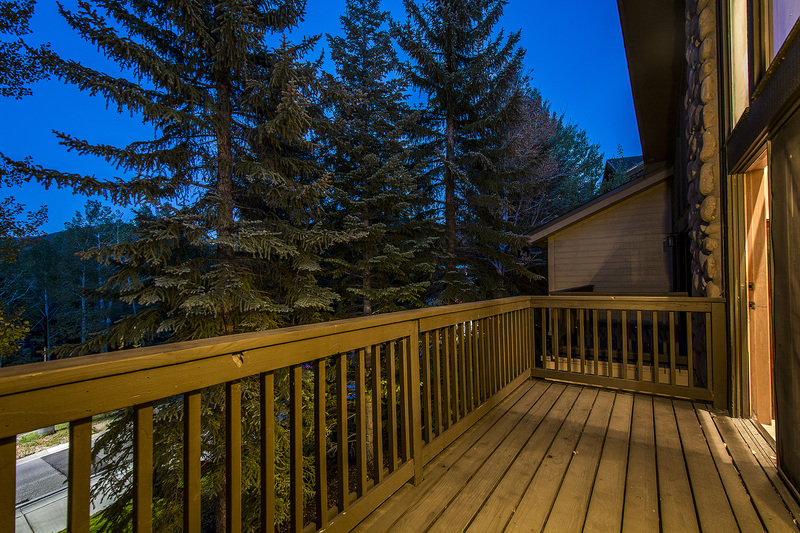 As you enter the property on the bottom floor you will find a mud room area with tile floors, a pine bench, hooks, and a closet where you can hang and store your outerwear. 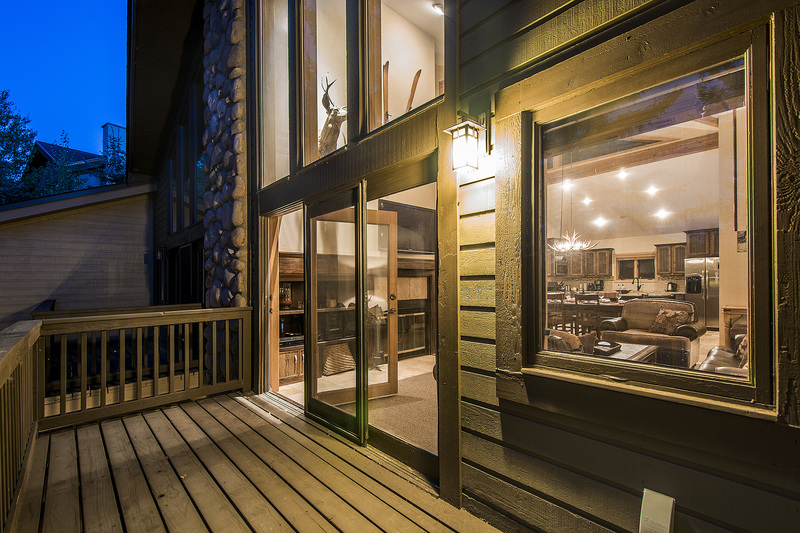 Or just put them directly in the washer and dryer right there off the entryway. 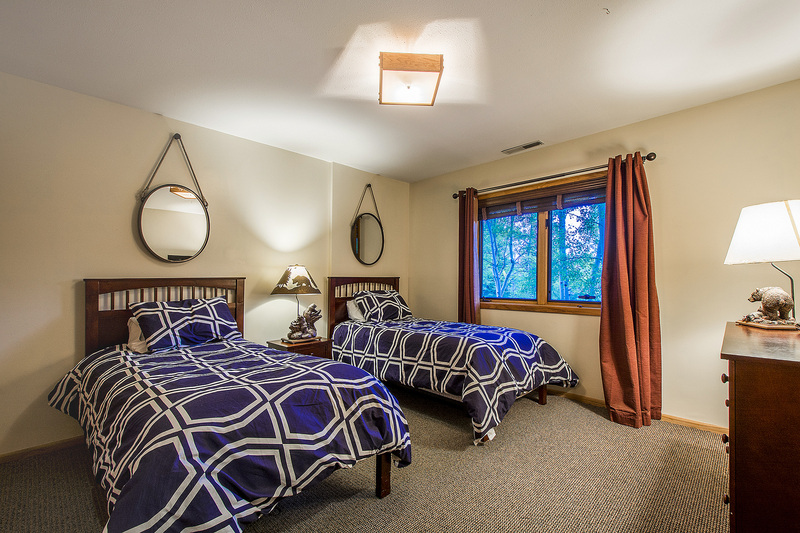 Off the mud room area you will find the first guest room with 2 twin beds, en-suite bathroom, wall-mounted TV, dresser, and nightstand with lamp. 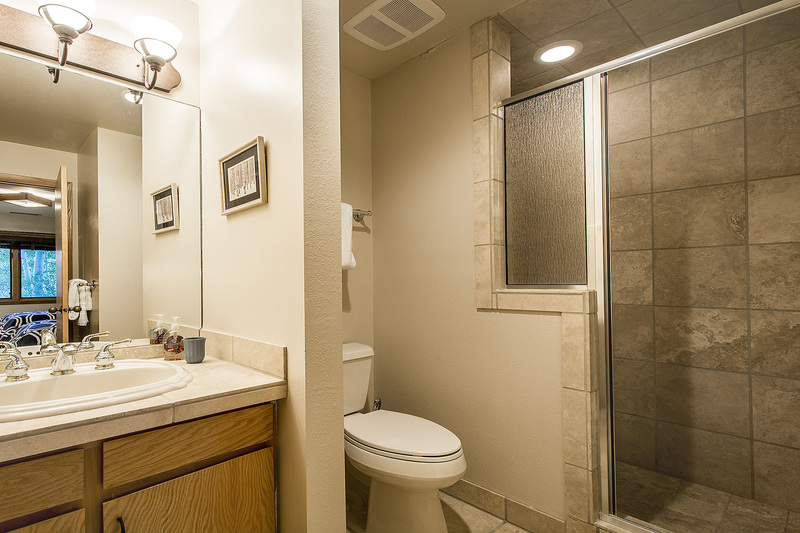 The en-suite bathroom has a walk-in tile shower with glass door, vanity with sink and cabinet. 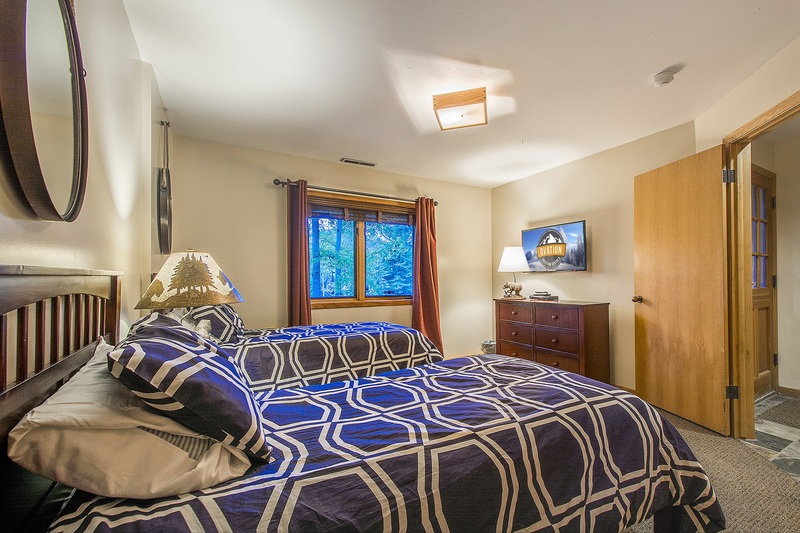 Also of the entryway is the second guest room with queen sized bed, en-suite bathroom, wall-mounted TV, dresser and 2 nightstands with lamps. 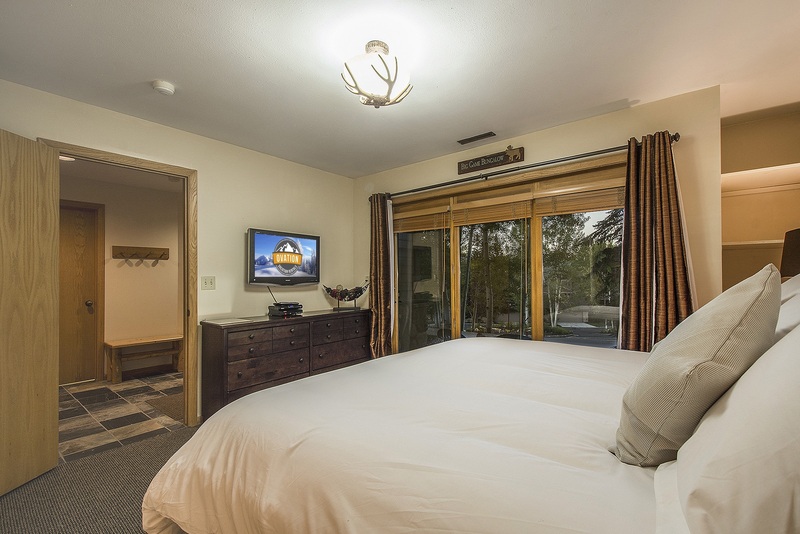 The en-suite bathroom has combination tub and shower, tile vanity and toilet. 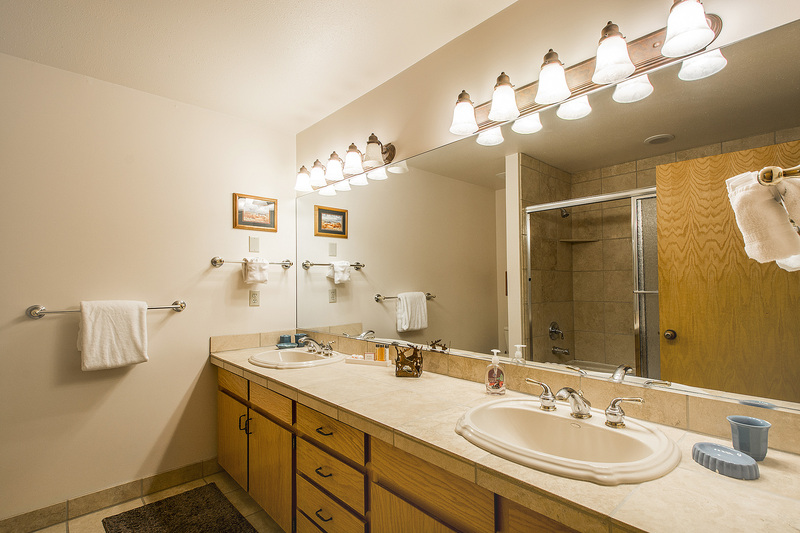 There is also a vanity outside the bathroom in the closet/dressing area. 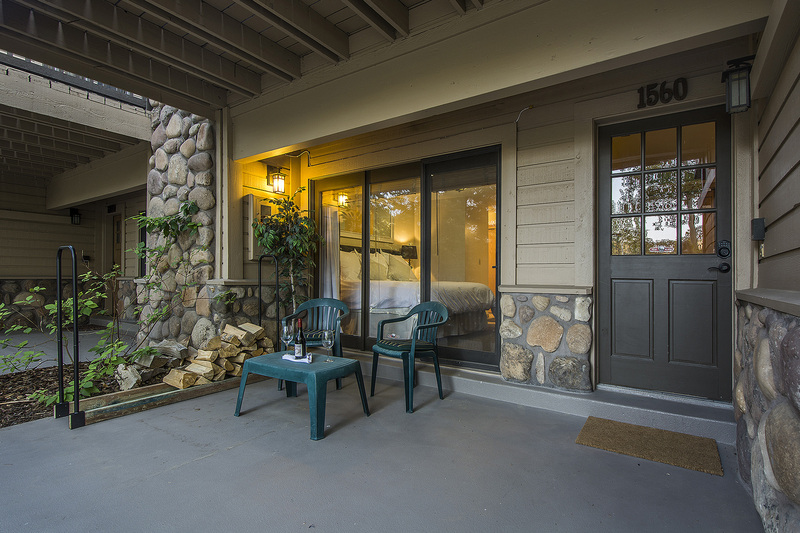 From the queen guest room you have access directly onto the first patio. 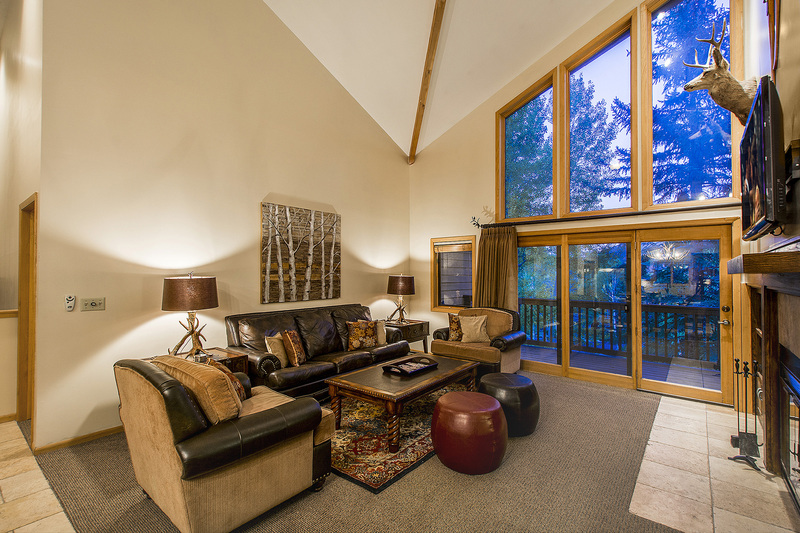 As you go up the stairs from the front entryway you will find the great room. 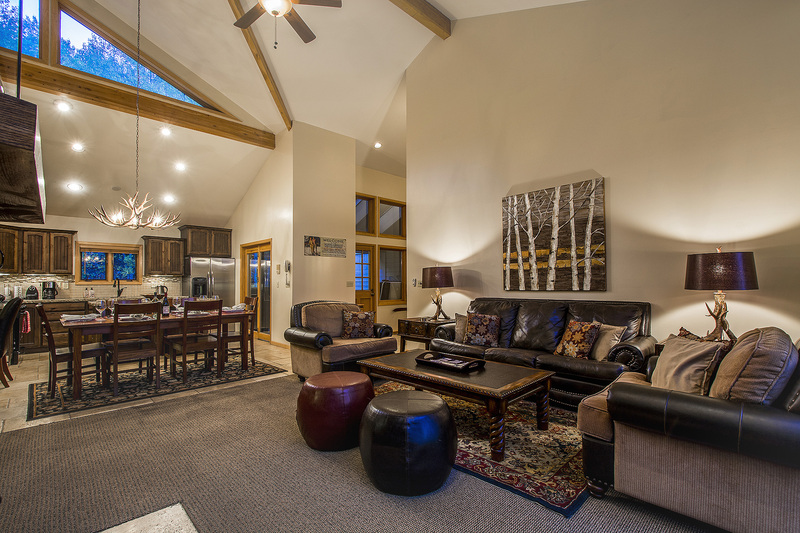 The great room has vaulted ceilings with wood beams, large wood burning fireplace, leather sleeper sofa, two large chairs, wall-mounted TV, ceiling fan and built-in shelving with desk. 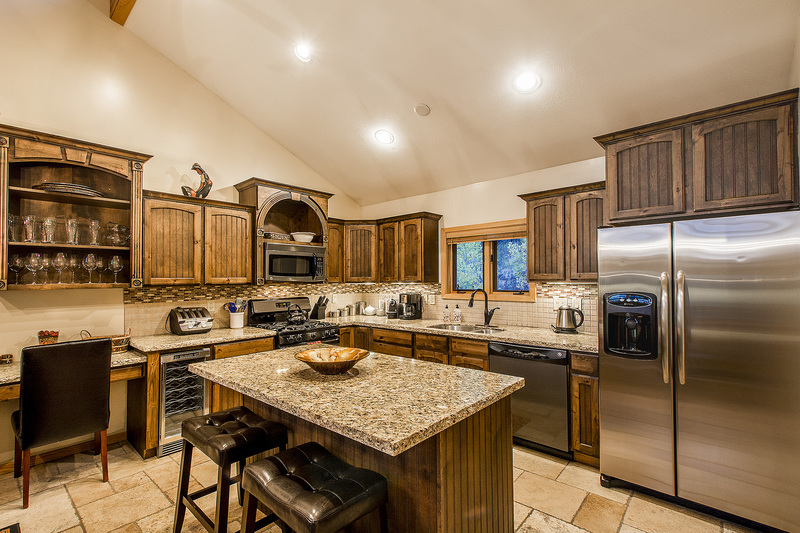 The fully equipped custom kitchen has high-end knotty Alder wood cabinets, granite counters, granite island with 2 bar stools, 5 burner gas stove and oven, stainless steel refrigerator , dishwasher and wine fridge. 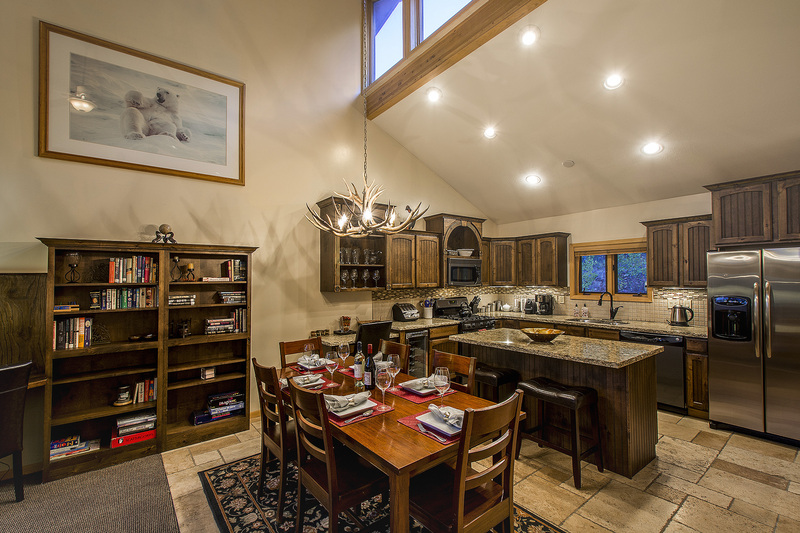 Make diner for the whole group and dine at the dining room table that seats 6 or Kitchen Island that seats 2. 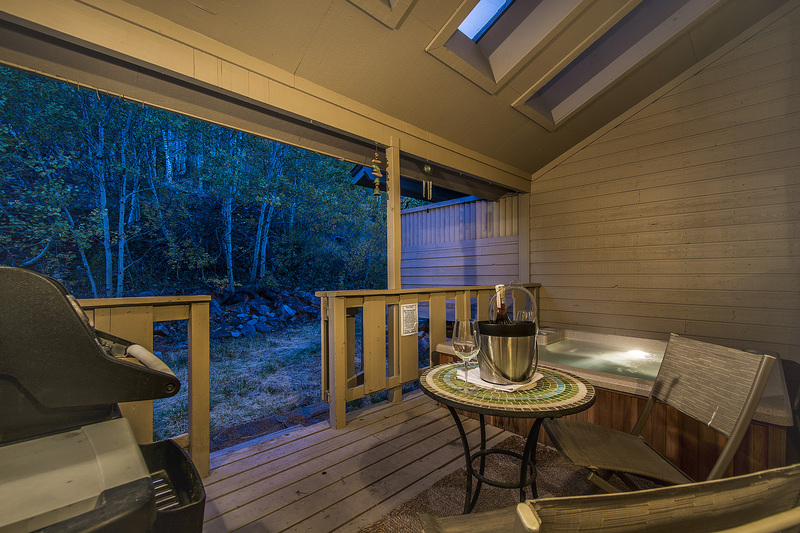 There is a patio right off the kitchen where create a wonderful BBQ meal on the Weber gas grill, relax in your own private hot tub or have a cup of coffee at the bistro table for 2. 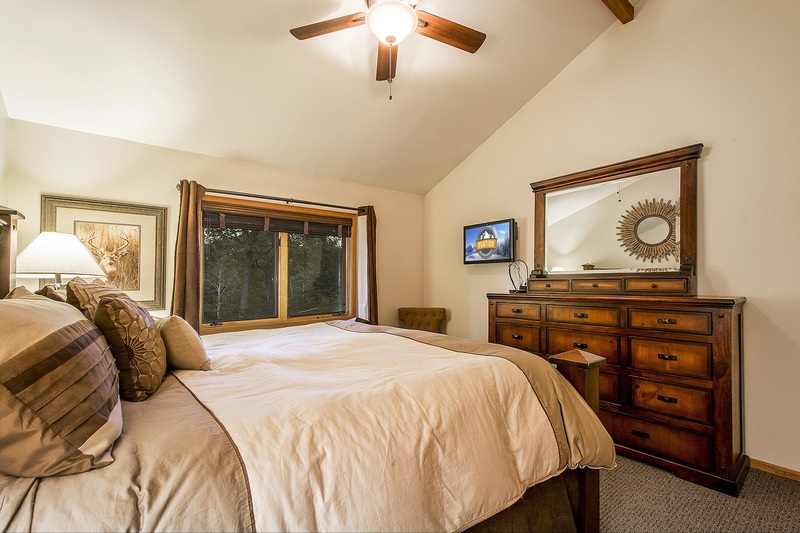 The master bedroom is on the same level as the great room and kitchen. 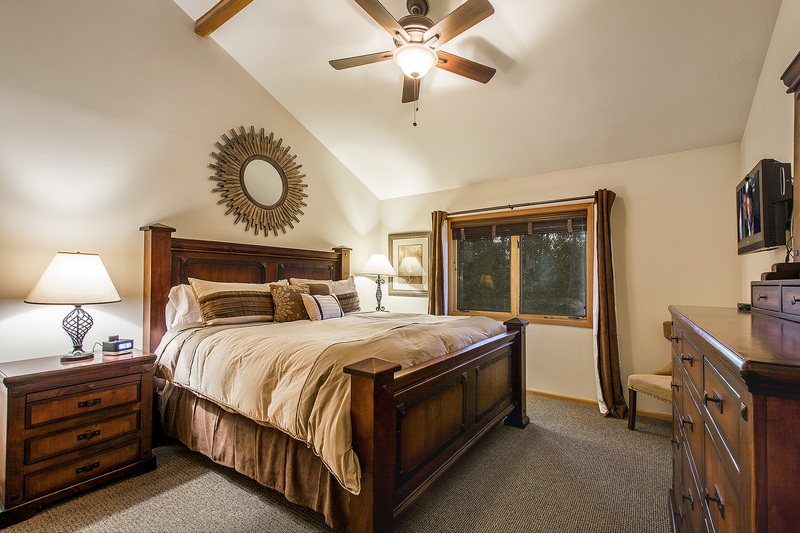 This well-appointed master bedroom has a king sized bed, en-suite bathroom, wall-mounted TV, ceiling fan, dresser and 2 nightstands with lamps. 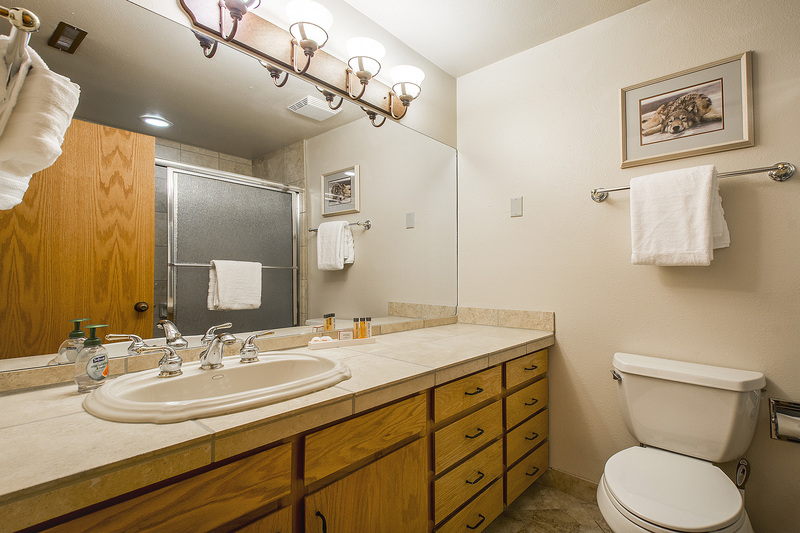 The en-suite bathroom has a double tiled vanity and combination tub and shower. 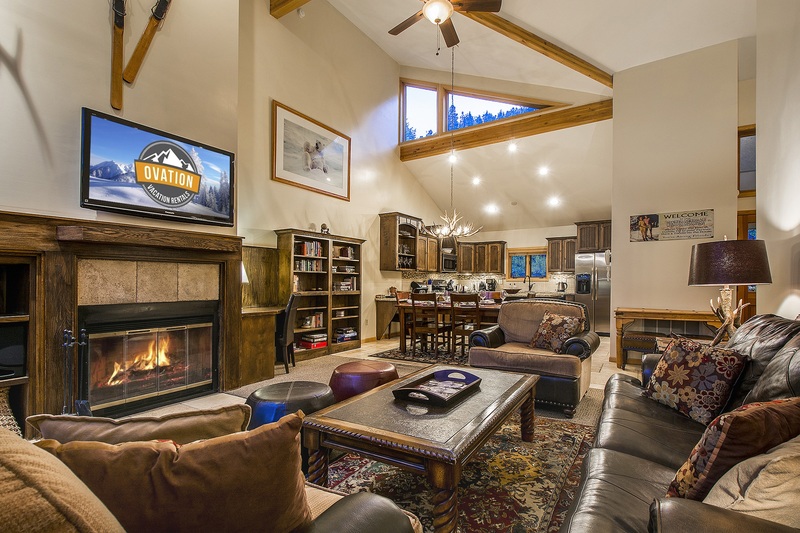 This is the perfect mountain retreat for the group with all the wonderful nearby activities, dining and events the area has to offer.